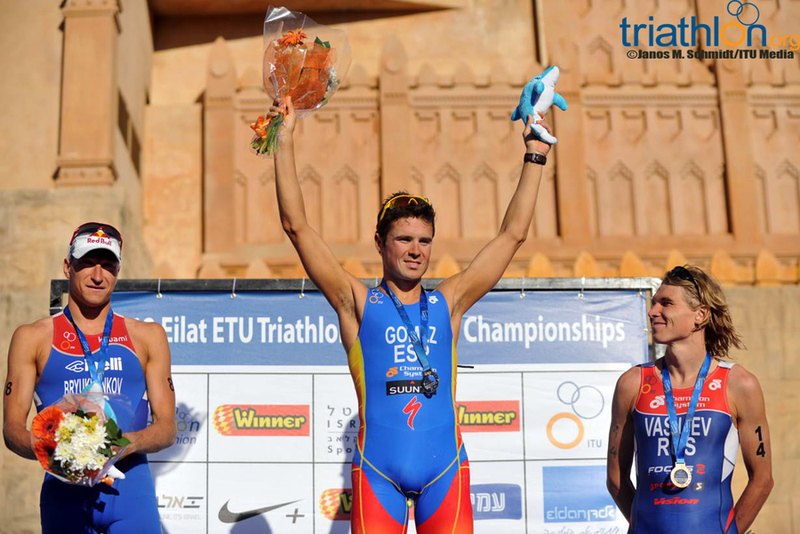 Javier Gomez stormed the run and left nothing to chance at the 2012 Eilat ETU Triathlon European Championships to take the European title for the third time in his career. Russia took silver and bronze with powerful performances by Alexander Bryukhankov and Ivan Vasiliev who just beat Tony Moulai (FRA) in a sprint to the line for third. The winds began to pick up as the elite men lined up at Eilat beach for the start of the race. Maximilian Schwetz (GER) led the way entering the second lap and was still heading the pack exiting the swim. By the end of the lengthy run up to transition, Dmitry Polyansky (RUS) left T2 first leading a large pack including Bryukhankov, Alessandro Fabian (ITA), Ivan Rana (ESP) and Gomez bringing up the rear. An incredible bike leg followed, beginning with the formation of two main packs. Russian Anton Chuchko pulled out ahead on the first lap with a 6-second lead over a group of 15 athletes including Sven Riederer (SUI) and Joao Silva (POR) followed by a second pack of similar size. Chuchko soon fell back into the pack and it was Rana and Vasiliev’s turn to attempt a breakaway gaining seven seconds on the lead pack. By the halfway mark on the bike, strong sandy winds were blowing the riders and not only was Rana and Vasiliev’s breakaway short lived, but the second chase pack had caught the leaders forming a huge group of over 30. Another breakaway was yet to come when Andreas Schilling (DEN) powered ahead, retaining his lead all the way up to the last lap when he was joined by Moulai. Behind them, the final lap brought the entire field back together to form one giant group entering T2. Moulai just had the edge over Schilling running out of transition with the huge pack following over half a minute behind. Rana and Peter Croes (BEL) were next out closely followed by Gomez, Riederer and a swarm of runners. Gomez wasted no time in picking up the pace taking the lead on the first lap of the run to gain ten seconds on his nearest challenger, Moulai. Bryukankhov was pacing himself in third position while Aurélien Raphael (FRA) and Fabian led a string of athletes. Unable to stay with the leaders, Riederer and Silva were running together already a minute behind Gomez by the end of the first lap. Entering the final lap Gomez had extended his lead with an extraordinary run, while disaster struck Moulai who had to serve a time penalty for failing to place his swim cap in the box during T1. Moulai dropped behind Bryukankhov as a result and was left to fight for bronze as Vasiliev made a surge for the podium along with Fabian in the final stages. Gomez proved untouchable throughout the run and powered home to claim his third European Championship title and first since 2009. Bryukankhov stayed strong in second position for silver and it was countryman Vasiliev who won the sprint to the line for bronze. “It was another step, it’s my first ITU race of the season and I know I need to run faster if I want to get a medal at the Olympic Games, but for the first step it’s a good race and an important title and good start to the season,” said Gomez, who solidified his Olympic spot with his win in Eilat which also marked his first big race of the season leading up to London 2012. Bryukhanov felt the stress of entering the race directly from the 2012 Dextro Energy World Triathlon Sydney but didn’t let it stand in the way of a medal in Eilat. It was an important podium place for Vasiliev who hopes to have secured his ticket to London. Earlier on in the junior men’s race Italy’s Matthias Steinwandter powered to victory with his long legs after entering the last lap amongst a group of five in contention for the title. He made his move with half a lap to go and it was enough to secure him the Championship. There was double joy for Italy as Delian Stateff (ITA) finished behind his compatriot for silver and bronze went to Kristian Blummenfelt (NOR). The European Championships continues tomorrow with the mixed team relays, the junior’s beginning at 8:00 and the elite’s at 10:00 followed by the paratriathlon at 13:00.